Freebox - Configure the Wi-Fi mode. 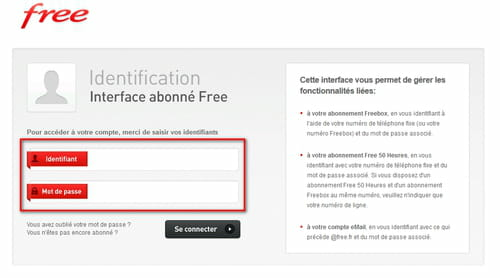 Go to the Free website: http://www.free.fr/adsl/index.html. The login is your phone number followed by "@freeadsl". Once you are on the cofiguration page/interface hover your mouse over "Ma Freebox" (My Freebox). Then click "Configurer mon réseau Wifi/Configure my wireless network"
Check the "Activer/Enable" to activate Wi-Fi. Validate your configuration by clicking the "Sauvegarder les paramètres/Save Settings"
Restart your Freebox (either by unplugging-plugging the power cord, or by holding down the "?" button of the Freebox remote and choosing the appropriate options. If you want to connect multiple computers to your Freebox wifi you should also enable the router mode of the Freebox. Published by jak58. Latest update on October 15, 2014 at 12:59 PM by Jean-François Pillou. This document, titled "Freebox - Configure the Wi-Fi mode.," is available under the Creative Commons license. Any copy, reuse, or modification of the content should be sufficiently credited to CCM (https://ccm.net/). 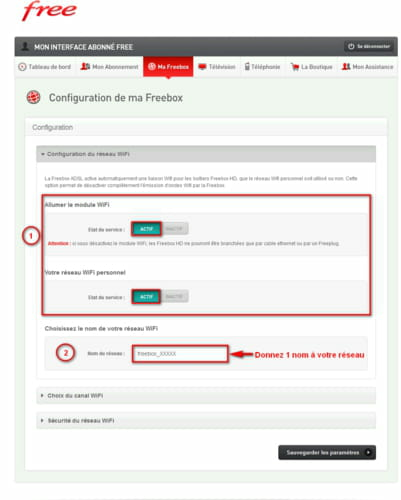 Freebox - Configure the router mode.